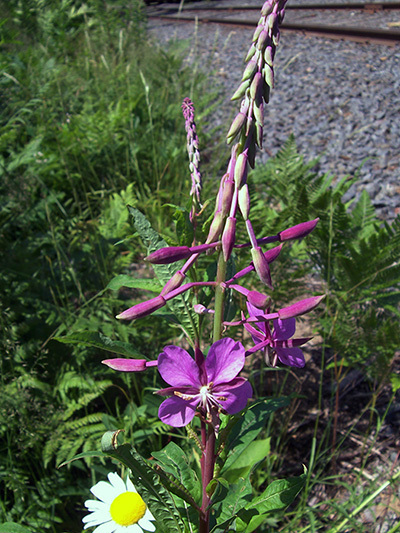 Many Fireweed can be observed in recovering areas of our forests, ancient forest fires, under power lines and glades cleared. Often accompanied by the Pearly everlasting, the Firweed is a plant present in the regenerating places of our woods. The flowers, situated at the top of the plant, appear in an elongated, almost spiky cluster, and they bloom in turn from bottom to top of the cluster. Each flower blooms for only 48 hours, but though hermaphrodites (having both sexes) self-pollination of a flower is impossible because it is protandrous (first male and then female), besides, the style (part of the pistil) white and very elongated and that appears on the second day is a remarkable feature of this indigenous (see third photo).